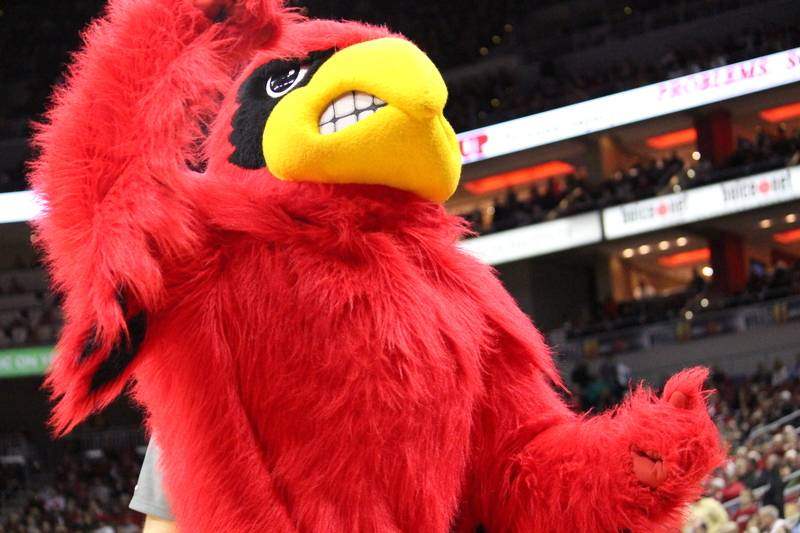 This game featured a ROLLER COASTER of emotions, Cardnation. 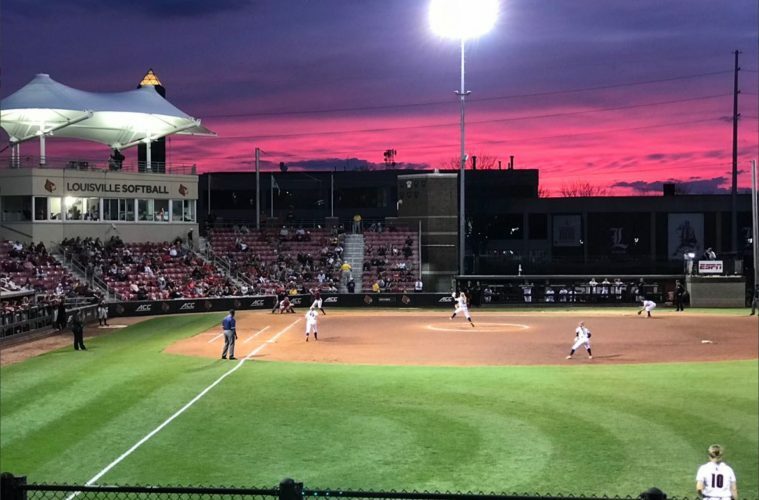 After a successful showing in Satruday’s double header, UofL welcomed the Seminoles back to Ulmer for a series finale featured on ESPNU on Monday night. 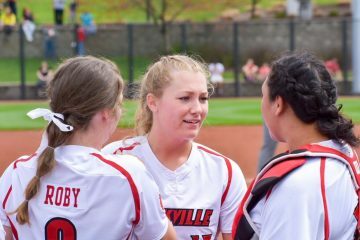 Sophomore Danielle Watson got the start in the circle for the Cards after allowing just one hit in the Cards’ win on Saturday. Freshman Rebecca Chung behind the plate. The Cardinals allowed 3 FSU runs to score in the top of the first. The defense was rattled as the Seminoles’ aggressive base running caught the infield way off guard… 3 bases stolen, an error in an unsuccessful pickle resulting in a run after a bad throw and only 1 out would require HC Holly Aprile to visit the mound 10 minutes into the contest to calm down the defense. The Watson/Chung pitching-catching duo would have to make serious adjustments to stop the frenzy. The team responded with a strike out and a ground out to stop the bleeding. It took the Louisville bats a little longer to get going in the contest. The first bottom 2 frames were won by FSU’s Meghan King when she managed to secure 6 outs in 16 pitches without the ball ever leaving the infield. In recent games, Rebecca Chung’s productivity at the plate had been pretty limited.. likely resulting in her being moved to the 7 spot of the lineup. 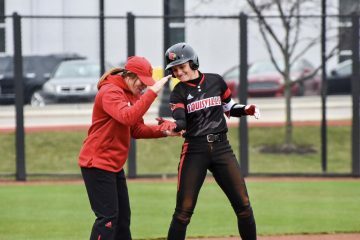 This change would prove to be the difference maker in the game as she would lead off the bottom of the 3rd after two 3 up-3 down series’ for the UofL offense. Chung took 9 pitches from King for the walk. The at-bat would require a player team meeting at the mound by the Seminoles. Chung would be relieved by a pinch runner (Jordyn Wolfe) as Charley Butler dropped one in between the first baseman and right fielder to arrive safely at first, Wolfe beating the throw attempt at second base to put 2 runners on as Maddy Newman would make her first appearance at the plate. Newman singled to LF to load the bases with nobody out. The bottom 3 of the lineup would be the most successful at the plate in the game accounting for 6 of the team’s 10 hits. Funke struck out but senior Sidney Melton comes through with with her 4th triple of the season to tie the score at 3 after her hit bounced off the 220 feet sign in RCF. Melton would be left on base but not before she gave the team a huge morale boost for the next half of the game. The defense responded with 4 up-3 down with outs made by Chung, Ferguson and a diving catch in foul territory by Butler in LF. The Cards looking to head back to the dugout and take the lead on the #3 Seminoles. Quickly, 2 outs were rounded up by FSU defense with Chung heading to the plate for her second appearance of the day. She watched a strike before connecting for a hit up the middle, Butler gets hit by a pitch almost immediately to put 2 on. 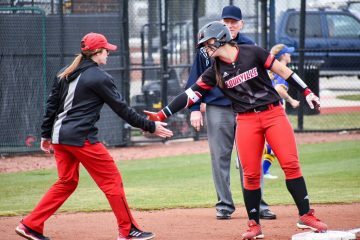 Newman connected on another one to LCF to record her first triple of the season, second hit of the game and put the Cards ahead 5-3 in the bottom of the fourth. FSU calls for a pitching change and Melton and Hensley go down in order… there must’ve been something in the 2 out water because with that, Taylor Roby singles up the left side to get on base. With a 1-1 count, Caitlin Ferguson takes the low pitch to the right field fence and taps the foul pole in fair territory for the 2-run homer, her 4th of the season. The Cards would lead 7-3 after 5 complete innings… just like we all predicted. Heading to the top of the seventh and the Cards just needed 3 outs to end this thing outright. Watson had already pitched 6 complete innings and lingered around the 100 pitch count but Aprile left her in there. Unfortunately Watson would load the bases on walks and just 1 strike out. 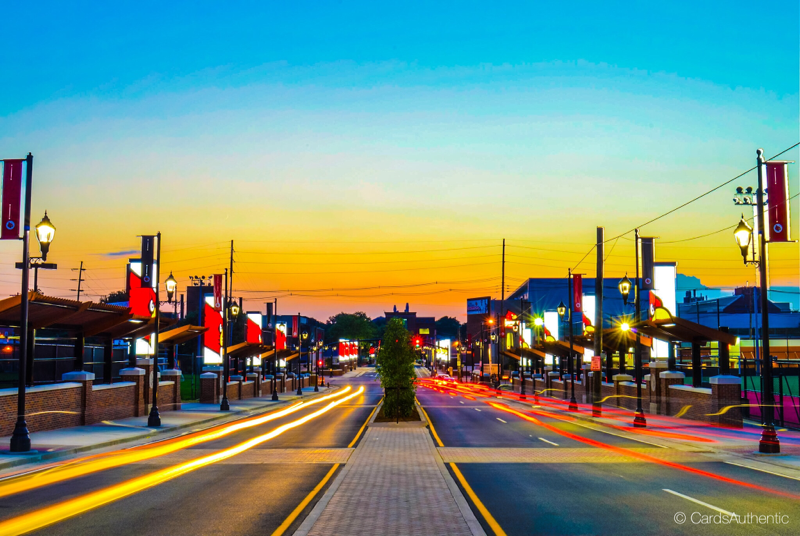 Nerves flying at Ulmer and it does not get any better, Cards fans…. Celene Funke attempts to snag a pop fly to shallow RCF but instead it bounces out of her glove as she slid under it…. one run scores to make it 7-4 with still only 1 out and bases loaded. FSU batter took a 0-1 count sailing to center field for the grand slam to retake the lead, 8-7. Pitching change for the Cards… Taylor Roby in for Watson. After 2 more stolen bases, FSU would plate another run on a hit CF to make the FSU lead 9-7 by the end of the top of the seventh. A total of 6 runs off of 4 hits in the inning. With the last home half inning to go, the Cards would not be mentally or physically defeated as FSU elected to put their starting pitcher back in the circle. UofL would take all the pitches they could to string this series of events.. Melton singled to LF to get on base early and Megan Hensley saw 7 pitches before taking the walk. A double play called by the first base ump would be reversed after Roby lined out to the second baseman and Hensley was almost caught off base. Aprile successfully challenged the call and Hensley was put back on first. 1 out with Ferguson headed to the plate. Ferg would take 10 pitches from King to walk and load the bases for the Cards. Kara Snyder struck out swinging to put 2 outs on the board with bases loaded and freshman Rebecca Chung once again heading to the plate. Nerves are FLYING at Ulmer!!! But not for Rebecca, I just had a feeling, yall. Chung mentioned afterwards that FSU had been throwing the same first outside pitch to her all game.. she got a hold of it and sent the ball line driving to the RCF fence. The Cards plate 3 runs and Rebecca Chung walks it off from second base to third to celebrate with her teammates, the Cards walk off in victory 10-9 and clinch the series 2-3 against the #3 ranked Seminoles.. it is the first conference series loss for FSU since 2012 and it wasn’t easy for Louisville. Chung finished 2-3 with 3 RBIs and 4 caught stealing. Maddy Newman was 3-3 on the day. 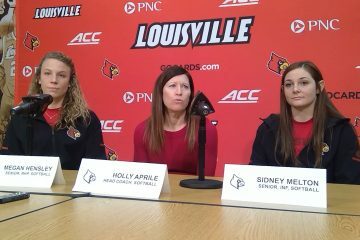 The series win marks one of the biggest and definitely a prominent notch in the Holly Aprile era for the UofL softball program. It is the first series win against FSU and a Top 5 team for the Cards. Louisville is now 12-4 at Ulmer Stadium this season. The Cards will head to Boston College for a weekend series before returning home and welcoming in-state rival Kentucky to Ulmer for a midweek matchup on April 17th at 6PM.